When I decided to make changes to my business and reach outside my local market, Upwork was the tool that I used to get there. Now? I'm hiring people from it, to help grow MY biz. There are a few really great freelancing sites out there, but for me this is the one that seemed the most effective with legitimate opportunities. It grew my business when I was brand new, and I'm still using it today on the other side. If you're just getting started with freelancing, I definitely suggest checking out Upwork. But, you need to be careful. I was completely shocked at how many inauthentic people were using this site to scam unsuspecting people like myself. I wanted to put together an Upwork Safety Guide, to teach everyone some of the things I learned the hard way. -Never download files that are sent to you via unsolicited job interview requests. These files are sometimes viruses or malware. -Never give out your personal information, and don't accept payment terms outside of Upwork. Once you have established a relationship with the employer, you should use your own discretion on this matter, but don't initially give anything out. All work and payments should be handled through Upwork, for your own protection. -Don't sign contracts or anything you don't fully understand and agree with. It's common for companies to request you sign a NDA, but anything outside of that may not be in your best interest. -If a contract or offer sounds too good to be true, it probably is. Follow your gut on this one, and don't be scared to walk away and cancel a contract if something feels fishy. I had to do this once; it was hard to walk away from the money I felt I was owed, but once I realized the employer wasn't above board, I knew it was in my best interest to cancel the contract and write-off the time I had invested. -Be vigilant with the employer's history. If they have no previous hires and have not verified their payment method, chances are they may not be serious and will either waste your time, your bid or be a scam artist. You can see I have circled in the image above where you can specifically search for payment verified jobs and employers with a hire history. -Do not waste your time searching through all the jobs. As I have done above, search for the specific terms and keywords you are qualified for. -Pay attention to the pay grade the employer is looking for. When you're just starting out, or if you have no experience, you may want to look for jobs where the employer is looking for the cheapest freelancers. You may have to take lower-paying jobs at first to build your portfolio. If you know what you're doing, look for the expert level jobs. -Ensure you fully understand any jobs you accept, as your history will be readily available for everyone to see. If you get a bad review, or it shows that you haven't completed jobs, it will damage your reputation. -Understand that actually receiving your money will take a good amount of time. The payment process is slow, so don't expect to get paid 2 days after completing a project. -There are some really great tests you can take, to prove your abilities. I suggest taking tests as a way to demonstrate you know your stuff, when you don't have any history or previous work to back it up. -Don't get discouraged. It took me a full month of applying for jobs before I finally got one. No one wants to be the first person to hire you. Eventually, someone will and that will start the ball rolling. My very first job was a blog article on email marketing. The pay was $20 and I spent HOURS working on it. Upwork is a great place to grow your business, you just need to be safe about it! 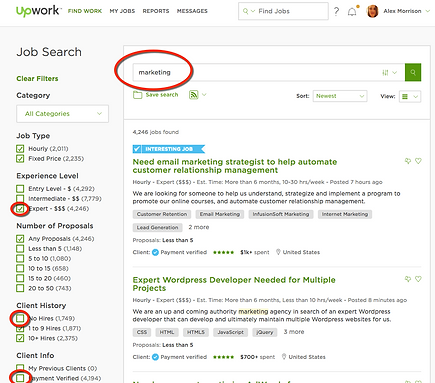 If you're not familiar with the ins and outs of how Upwork operates, there is a comprehensive review and guide that will explain basically everything here. If you're ready to start attracting your ideal clients through your content, click here to connect with Alex and learn how.